Though foot pain affects many people and is a common complaint, its causes can greatly vary. Pinpointing the root of your foot pain can help you and your doctor create a treatment plan that will get you back on your feet and help you remain pain-free. Read below to learn more about foot pain and how your podiatrist, Dr. Rose Sotolongo at The Foot Doctor in Ridgeland, MS, can help treat it. When should I see a doctor for my foot pain? If your foot pain lasts for more than a few days, becomes severe, or begins affecting your daily life, you should schedule a visit with your doctor to have it checked out. Additionally, if your foot pain is due to injury and you are feeling pain so severe that you cannot put any weight on the foot, are experiencing severe swelling, or there is a visible lump or bump in the painful area, you should seek medical care as soon as possible. How will my doctor diagnose my foot pain? At your examination, your podiatrist will use various techniques to investigate your symptoms. Imaging techniques, such as MRIs or x-rays, will help your doctor see into your foot to examine its bones and connective tissues. They will use your physical exam to inspect the outside of your foot and search for abnormalities, as well as gather your lifestyle, family, and medical history. Together, these clues can help your podiatrist find the correct diagnosis to begin treating your condition. The treatment for your foot pain will depend on the condition or injury causing it and its severity. In some cases, foot pain may respond quickly to the RICE (rest, ice, compression, elevation) method, while others may require therapies, such as physical therapy or injection therapy, or even surgery. Working with your foot doctor is the best way to find the appropriate treatment for your foot pain. Need help? Call our Ridgeland office today! For more information on foot pain, its causes, and its treatments, please contact Dr. Rose Sotolongo at The Foot Doctor in Ridgeland, MS. Call (601) 206-9101 to schedule your appointment with Dr. Sotolongo today! The feet endure a lot of wear and tear over the years. As the feet age, they can become more prone to foot pain, injury, or arthritis and other conditions. Since the feet can become more vulnerable with age, it is important not to neglect them. There are many things you can do to care for aging feet, including seeing a podiatrist for periodic checkups. A podiatrist can check for potential problems and recommend specific ways to care for your feet. At The Foot Doctor, Dr. Rose Sotolongo is your Ridgeland, MS podiatrist for helping you maintain healthy feet. Seeing a Ridgeland podiatrist regularly is another important way to care for aging feet. During the foot exam, the podiatrist can check that the feet are healthy and recommend specific ways to avoid sustaining an injury or developing a painful condition, such as arthritis. For individuals who do develop arthritis in the feet or ankles, a podiatrist can recommend methods and techniques for managing any pain or discomfort resulting from the arthritis. Caring for your feet is especially important as they begin to age. 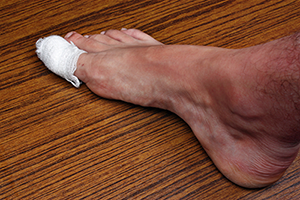 Proper care can help you minimize or avoid injuries, foot pain, and other problems. Caring for your feet includes periodic podiatry exams. To schedule a podiatry exam with Dr. Sotolongo, your Ridgeland, MS, podiatrist, call The Foot Doctor at (601) 206-9101. Are You Dealing with Toe Pain? Even if you don't necessarily spend a lot of time on your feet, a little pain and discomfort is common and normal from time to time. From wearing shoes that are too tight and uncomfortable or lack adequate support, engaging in physical activities and workouts that put repeated pressure on your feet and ankles, or joint problems like arthritis, foot pain is very common and can affect your mobility and quality of life depending on the severity. Dr. Rose Sotolongo, a podiatrist at The Foot Doctor in Ridgeland, MS, recommends scheduling an appointment if you are experiencing pain or swelling for more than a few days to rule out an injury or orthopedic condition like osteoarthritis. A quarter of all of the bones in the human body (26 in total) are located in the feet. Along with the bones, there are 33 joints and over 100 pieces of connective tissue (muscle, tendons, ligaments, and cartilage) holding everything together and providing stability and range of motion. Trauma, strain, or normal wear and tear on any part of the foot can cause pain and other symptoms like inflammation (swelling) and even affect your ability to put pressure on and move the affected part of the foot. For more information on the causes and treatment options for toe pain or other foot and ankle conditions and injuries, contact The Foot Doctor today by calling 601-206-9101 to schedule an appointment with Dr. Sotolongo.